Geological engineering is the application of engineering principles to the natural materials and fluids found in the earth, including rocks, soils, groundwater, petroleum and natural gas. Geological engineers are trained to characterize and predict the behaviour of natural materials and fluids. They work to find and develop the resources that society needs for its survival and in the disposal of society’s wastes in a manner that results in the least possible disturbance to the environment. Geological engineers also work to design and develop stable building foundations, bridges, dams, highways, landfill sites and waterways. 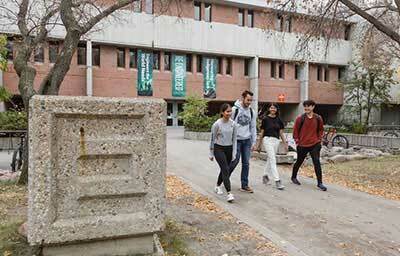 All first year engineering students will take a common set of classes before entering a specialization, such as geological engineering, in their second year. Introduction to engineering geology and the engineering properties of geomaterials including strength, compressibility and permeability of soils and rocks. Labs, case studies and field trips emphasize slope stability, ground monitoring, instrumentation and the engineering significance of geological processes and geomaterials. Fundamentals of structural geology, applied geomorphology, site investigation technology, geophysics and airphoto interpretation. Physical properties of rock. Rock stress-deformation behaviour and failure. Laboratory and in situ testing. Geomechanical, geotechnical and petrophysical problems of interest to the petroleum industry: petroleum well drilling, borehole breakouts, wellbore stability, hydraulic fracturing, subsidence and compaction due to oil and gas withdrawal. The Mining Option in Geological Engineering is six courses and a twelve-month internship that provides a focus on mining industry topics.